Thanks to feedback and community contributions, we have made several changes to the Mill One design that make it better, stronger, and more reliable. Most of these changes are shipping now, and new units come with changelogs that detail changes to assembly that may not be listed in the official V2 assembly manual. This list will cover the most major changes to the design, all of which can be found on Onshape. Please note that some of the designs may be in progress, partially complete, or have been created to just try out different ideas. We will update our Thingiverse and other open source documentation in the future once designs have been finalized. Additional mounting points to the Z axis. 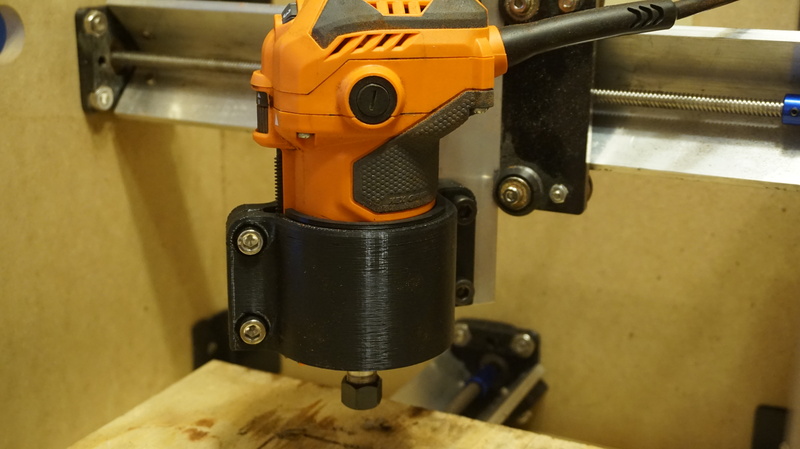 Several users have made the mod of adding additional mounting points to the Z axis for the router mount for more flexibility in mounting options or to add other larger, heavier routers to the Mill One. New Mill Ones now come with two additional M8 mounting points on the Z axis rail and a larger, more solid router mount. With the taller mount, users can adjust the router up and down in the mount to allow for more clearance for vices and other work holding apparatus. This change greatly increases the stiffness of the Z axis, allowing the Mill One take more aggressive cuts. 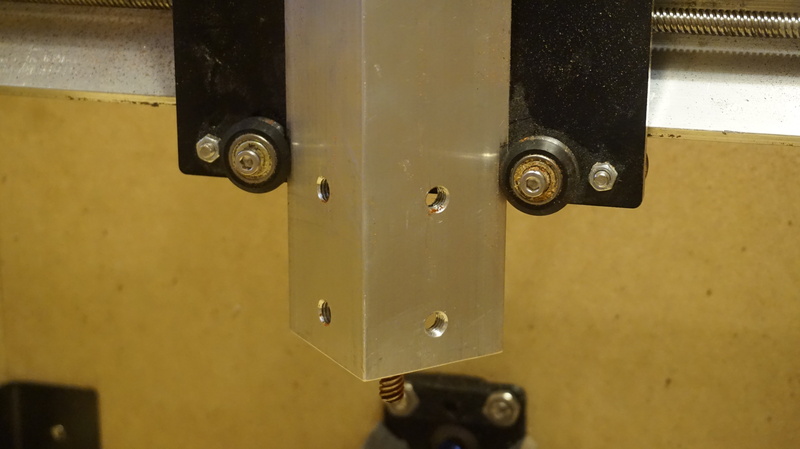 As some users may have noticed, the 200mm lead screw sticks out slightly from the bottom of the Z axis rail. Although formerly this is not an issue since the router extends further down than the lead screw, with the larger router mount, users can move the position of the router up or down which could cause interference with the lead screw and the workpiece. To prevent this, the 200mm lead screws have been changed to 150mm lead screws. Please note that this does not affect the Z axis travel. The new electronics holder improves on the older version of the electronics holder in two ways. One, it allows for the use non-screw on type female DC jacks, which are far more common than the screw on type which were used before. This means folks who are building their own Mill Ones can reproduce this component more easily. Second, we have changed from using a friction based clip to hold on the cover of the electronics holder to using a flexible clip based design. This means that no only it is much easier to clip on and off, but makes it much more unlikely that the cover will fall off during transportation. This design change makes it a lot easier to print on a wider variety of 3D printers since the new clip design allows for more variance in print tolerances. One of our former suppliers has stopped supplying a specific type of ACME nut which includes an M3 thread in each mounting poin. This means that we are reverting back to a more commonly available version of ACME nut without those threads. Users of the V1 version of the Mill One will know that this is typically the most finicky part of assembling the Mill One due to the fact that the M3 hardware is really small. To fix this in the current version, we will be pre-assembling the ACME nuts with brass nuts included. With the help of a jig and a electric screwdriver, we can produce these parts fairly quickly, so to save folks the trouble of having to put them together themselves, we’ll be doing it for you.